A typical 7.65mm Eibar “Ruby” pistol. This one is unmarked & has clear plastic grips. The Eibar pistol was made in Spain by various manufacturers starting about 1905. The name comes from the town in the Basque region of Northern Spain in which it was primarily manufactured. At the time, Spanish patent law allowed the copying of any manufactured item that was not being sold in Spain, and Spanish gun makers rushed to copy the very simple Browning-designed 1903 FN Browning / 1903 Colt “Hammerless” .32 pistol before it could be marketed in Spain. The 1903 Browning was blowback operated, had a concealed hammer, a thumb-operated manual safety, and the first grip safety ever to appear on an automatic pistol. 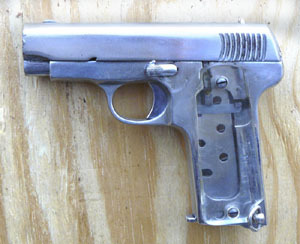 The Eibar pistol was a simplified design which often eliminated the Browning’s grip safety, moved the manual safety up toward the trigger, and utilized an exposed extractor. Esperanza y Unceta (later known as Astra) began manufacturing Eibar type pistols around 1911 under the trade name Victoria. 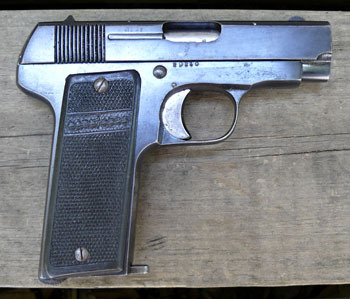 The Victoria was the best known prewar Eibar pistol. Gabilando y Urresti (known today as Llama Gabilando y Cia) began manufacturing an Eibar type pistol with an extended magazine and grip around 1914, which they called the Ruby. The Ruby was adopted by the French armed forces in 1915, and eventually the name “Ruby” became a generic term for the type. I do not know if Gabilando saw World War I coming, but they were well-positioned to offer their Ruby pistol to the French after the war broke out. The French did not have the industrial capacity to produce the number of small arms they needed and, since the Germans were occupying the northern portion of France, it was natural for the French to turn to the Spanish gun makers located in the Basque country just across the Pyrenees. The .32 could hardly be considered a military round, but it had achieved great popularity in Europe and had been designed for low power blowback actions which were easy (and cheap) to produce. Gabilando’s original contract was for 10,000 Ruby pistols per month, but within a year the French upped their request to 30,000 per month, and eventually to 50,000. Later in the war the Italians also placed large orders for the Ruby. Most production records were lost during the Spanish civil war, but estimates for total production of the Ruby range from 500,000 to over a million. Gabilando did not have the production capacity to make 30,000 pistols per month any more than the French did, so they subcontracted production to other firms in the Eibar region. The initial contracts were with four companies: Bruno Salaverria y Compañia, Eceolaza y Vicinai y Compañia, Hijos de Angel Echeverria y Compañia, and Armera Elgoibaressa y Compañia. Later still, other firms took up production and sold their weapons to the French, including Esperanza y Unceta, S.A. Retolaza Hermanos y Compañia, Beistegui Hermanos, and others. The firm of S.A. Alkartasuna was formed by employees of Esperanza y Unceta, with the blessing of its management, specifically to manufacture Ruby type pistols for the French. Gabilando attempted to exercise some form of quality control and insisted that all the guns be shipped by them, but the fact was that individual smiths, with varying skill levels and often using backyard forges, were working soft steel into various parts for the Ruby--so quality varied widely. Most Ruby pistols show machine marks, or even file marks from hand filing. Slide serrations were cut with a lathe (probably some of them foot-operated) rather than a mill, and hence were semi-circular rather than straight. Most grips were of wood and were unmarked (though some models had horn or hard-rubber grips). The safety on the Ruby locked only the trigger, so if the gun were dropped the hammer might still fall and set off a cartridge; whereas the 1903 Browning was designed in such a way that the safety locked the sear and prevented the hammer from falling (it probably wasn’t completely fail-safe, but it was better than the Ruby, and of course the Browning also had a grip safety). After the war, Spain continued to produce large quantities of pistols. Gabilando dropped the Ruby line after 1918 and moved on to clones of the 1910 Browning such as the Bufalo and Danton. 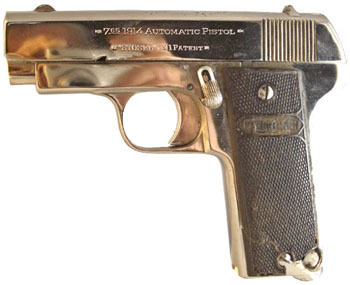 Astra also dropped their Eibar type pistols some time after World War I. But the nearly 50 other gun manufacturers in Spain continued to produce Ruby or Eibar -type pistols right up to the beginning of the Spanish civil war. Many different brands were made to appeal to different markets, and pistols were made in many different sizes in both .25 and .32 caliber. Brands included Action No. 2, Alkartasuna, Allobrage No. 1, Asiatic, Azul, Crucero, Express, Errasti, Fiel, Joha, Kapporal, Le Secours, Liberty, Paramount, Praga, Premier, Puppel, Royal, Singer, Stosel No. 1, Union Model III, Victoria, Vincitor, Waldman, and Walman. To field strip a ruby pistol, make sure the chamber is empty, remove the magazine, and draw the slide back and lock it open with the safety lever. Grasp the barrel and rotate it--the barrel lugs will come out of their grooves and you can draw the barrel forward. Then simply turn the barrel back to its normal position and draw it forward out of the slide. Release the slide lock/safety lever and draw the slide off the frame. The particular gun in this story is a Stosel, and according to Gene Gangarosa it was made after the First World War, though our gun is clearly marked 1914. Hogg and Weeks in Pistols of the World state that the Stosel was made by Retolaza Hermanos of Eibar. The Retolaza brothers had been in the pistol business since the 1890’s, when they produced ‘velo dog’ revolvers under the names Brompetier, Velo-Brom, and Velo-Mith, and were one of the firms who manufactured their own line of “Ruby” pistols to sell to the French during the war. Hogg and Weeks reveal that the name of the Russian commander at the 1904 Siege of Port Arthur during the Russo-Japanese war was Stossel, whose name would properly be spelled with one ‘s’ in Spanish and who would have been well known in the era. Hogg and Weeks believe that a Stosel automatic pistol may have been produced as early as 1906-1907, though they note that the earliest date known on one is 1912. They state that there was a “6.35 1914 Automatic Pistol Stosel No. 1 Patent” version produced during the Great War, as well as the 7.65mm version we have here, and that the 7.65mm is identical to the ‘Liberty’ and ‘Paramount’ pistols also produced by Retolaza Hermanos in the same period. Hogg and Weeks make no mention of the Stosel being a “Ruby” or “Eibar” type pistol, though they do mention that Retolaza “...joined in the 1915 gold rush, and appear to have continued producing cheap automatics until the Civil War put an end to their activities.” We have no idea how the gun in our story came into the United States. It is not marked “Made in Spain,” as it would have been if it were legally imported after the war. The fact that it has straight serrations on the slide, rather than curved, may indicate later production, though most likely it simply indicates that Retolaza had better manufacturing equipment than many of its competitors. The blued gun shown above is another Stosel I bought at a gun show. When I first took it apart, I had trouble getting the slide off the frame. It seems the hammer sticks up just enough that it interferes with removing the slide--you simply have to pull harder. This gun is in reasonably good condition for one nearly 90 years old, but it is very rough on the interior. After cleaning and lubing it carefully I had to blow it out with compressed air to remove all the threads from the cotton patches I had used, which had caught on sharp edges and rough spots inside the gun. Normally when I lubricate a gun with all the modern lubricants at my disposal it operates as smooth as glass, but lubrication didn’t seem to make much difference with the old Stosel. I did notice that all the various parts are stamped with a similar number indicating they are matched to each other. The nickeled gun below is the one that belongs to my uncle. E.B. : So tell me the story of this gun, and I’ll change the names to protect the guilty. Uncle Harry: Well, they’re all deceased... This gun belonged to my grandfather, my mother’s dad, who carried it probably for 20 years as a nightwatchman. When he passed away his son, who was my uncle, asked me if I wanted it. I said, “yes, I’d like to have it,” and I asked him, “where did he get that gun?” My uncle said, “I give it to him,” so I asked him where he got it. He said: “Well, years ago when I was a young man me and this buddy of mine went out to the bootlegger’s place up there in Kansas to buy some whiskey. When we went in we noticed the old guy running the place, the bootlegger, was sitting there, passed out, asleep, with this gun in his belt. Well, this buddy of mine grabbed two fifths of whiskey and said ‘Come on, let’s go!’ God dang, I was afraid that son -of-a-gun was gonna wake up, so I grabbed his gun out of his belt and we run and high-tailed it out of there. And then when Dad retired, I said I’ve got a gun you can carry as a weapon, now that you’re a night watchman.” So he carried it all those years, and after my grandfather passed away my uncle give it to me, which was in the 50’s--I’d say the ‘55, ‘56 time-frame. E.B. : Do you have any idea approximately what year this took place? Was it during prohibition? Uncle Harry: Wasn’t necessarily prohibition, but it could have been. Kansas was dry, it stayed dry for years, and you had to go out to a bootlegger, a guy that sold whiskey illegally, to get a bottle of whiskey. That was known throughout Kansas. The bootleggers, they used to put out a sticker that said “Keep Kansas dry for Kansas youth.” The bootleggers put that sign out, and all the church people pasted it on their bumpers. Later on, a friend of mine, who runs a pawn shop over here in Hearst, Texas, he was going to have a gun nickel plated, and he said “you want to get that nickel plated?” and I said yes. So he had it nickel plated, and I’ve kept it all these years. Handguns & Rifles, by Ian Hogg. Gramercy, New York: 1999. “Spain’s Ruby Pistols,” by Gene Gangarosa, Jr. Handguns, April 1997. Article and photographs copyright 2007 by Ed Buffaloe. All rights reserved.